This decal sheet comes in 1/72 scale. 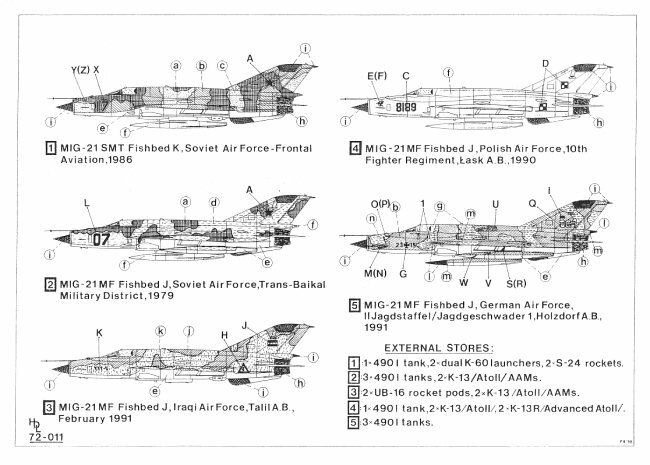 The decal sheet includes stencils for one of five MiG-21's, plus markings for the 5 different MiG-21's. 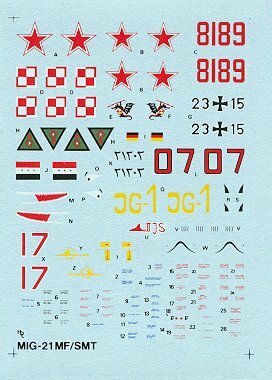 This decal sheet covers the MiG-21 from an Iraqi one during Operation Desert Storm to a German MiG-21 after the unification of Germany. 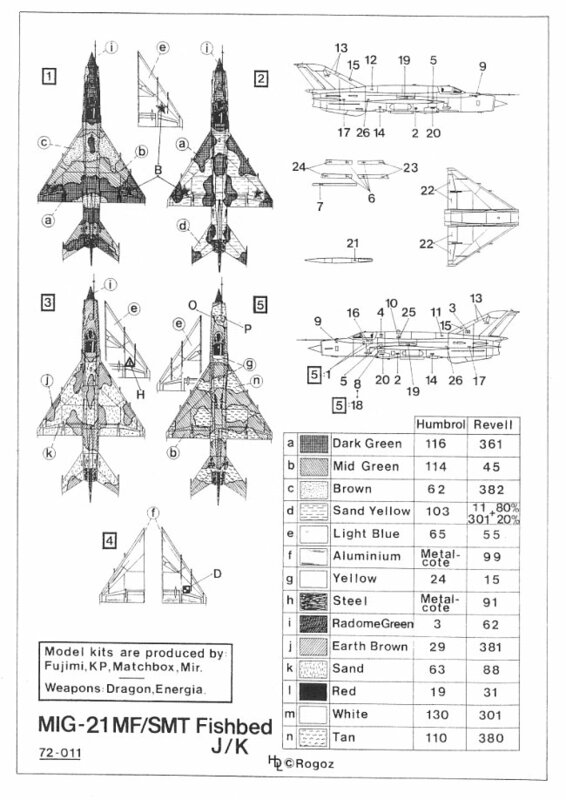 The painting options include everything from a 2 tone Earth Brown and Sand Iraqi Desert Scheme from Desert Storm on this sheet to a mid Green and Tan paint scheme of the German MiG-21. One of the planes include some nose art, while the German plane includes a Sharks Mouth by the nose. The quality of the sheet is good....excellent colours.....clear printing and completely in register although the stencil data for the 1/72 stencils are too small to be clearly printed and readable. I recommend this sheet to anyone looking for interesting options to the kit decals. Recommended kits are the 1/72 Fujimi, KP, Matchbox and MIR kit. Decal option #1 is a MiG-21 SMT Fishbed K of the Soviet Air Force-Frontal Aviation. The paint scheme is Dark Green, Mid Green and Brown on the topside with some Randome Green on the top of the tail. The nose cone is Randome Green and the underside is Light Blue and the fuel tanks are Aluminium. Markings also include a yellow jet profile on the sides of the nose.  Decal option #2 is a MiG-21 MF Fishbed J of the Soviet Air Force of the Trans-Baikal Military District in 1979. The paint scheme is Dark Green and Sand Yellow on the topside. The nose cone is Randome Green and the underside is Light Blue and the fuel tanks are Aluminium. Decal option #3 is a MiG-21 MF Fishbed J of the Iraqi Air Force out of Talil Airbase in February 1991. The paint scheme is Earth Brown and Sand on the topside. The nose cone is Randome Green and the underside is Light Blue. Markings include some Arabic writing on the sides of the fuselage nose area. Decal option #4 is a MiG-21 MF Fishbed J of the Polish Air Force of the 10th Fighter Regiment out of Lask Airbase. The paint scheme is Aluminium on the topside with some Randome Green on the top of the tail. The nose cone is Randome Green and the underside and the fuel tanks are Aluminium. On the side of the nose is a very cool little image of a Dragon holding a shield and preparing to throw a spear. Decal option #5 is a MiG-21 MF Fishbed J of the German Air Force of IIJagdstaffel/Jagdgeschwader 1 out of Holzdorf Airbase in 1991. The paint scheme is Mid Green and Tan on the topside with some Randome Green on the top of the tail and a white stripe by the wingroot. The nose cone is Randome Green and the underside is Light Blue. The fuel tanks are Mid Green on top and Aluminium on the underside with Red nose cones. This plane is loaded with interesting markings including a Sharks Mouth with Eyes above it on the fuselage nose and smaller closed mouth and eyes on the fuel tanks. There is also a big yellow "JG-1" on the tail. Plus there is a red IIJagdstaffel insignia on the left side of the fuselage half way down the plane.